Edited by radmutant69 at 00:43, 13 Jan 2019. It always names the first frame as 'frame 001' even if it shouldn't, if you import the image as a 'layer' file. This is why I used to importing everything as animations some time ago because I also had issues with it. 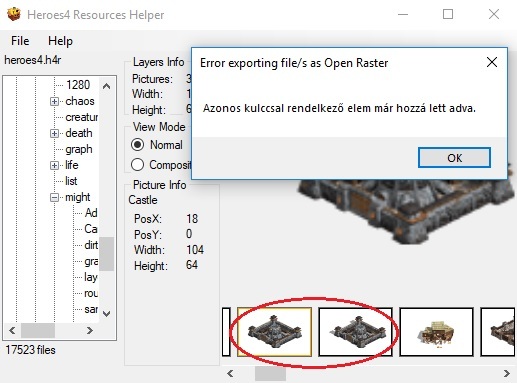 This (for example) can't be exported by the ResHelper, thanks to the duplicated 'Castle' layer. This is something like that error what Nimo talked about before his last fight against Ilive... I guess. The same thing happens when one tries to import an image with eg. a 'frame 001' and a 'frame 001 #1' layers though. These are the bugs or errors I can recall about Namerutan's tool. I am not sure the layer renaming would be necessary in the Resource Editor since it probably won't containing the same problems, but if it isn't too difficult to code, hmm... why not? That was some nice visual examples. I recall I had the same export issue with one of the artifact layers, wondering why, but I get the same error message. Can you use the ResEdit2 to export the layers? (this program never really worked for me though).. 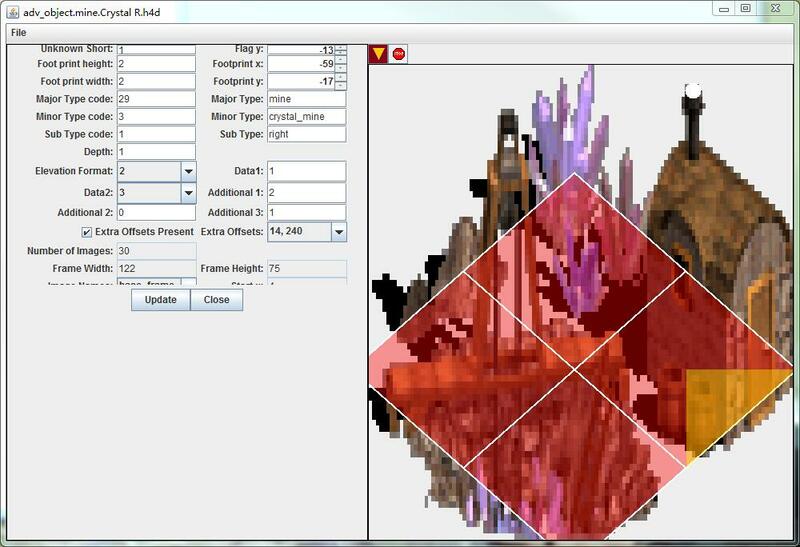 I agree if it isn't much work, it would be neat if the ResourceEditor could also export layers. Also I just encountered some oddities. It can open/view most adventure objects, but a few animals (crocodile and salmons) and others it won't open for viewing. Well yes but only frame by frame as individual BMP images so I don't recommend it because then you have to rebuild the whole layer file from scratch. 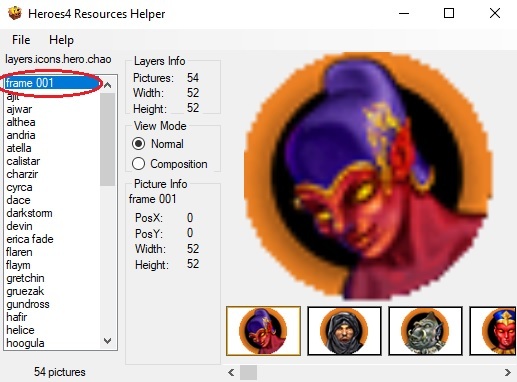 A much easier way is extracting the layer, rename the doubled frame or delete it by hex editing and then the ResHelper can export it easily. Ah gotcha. Yeah, that would probably be a pretty simple feature to add. I'll include it in the OP. First release of the tool or a release of what what it can help edit? Well new objects have been released. See the New Objects Package tread for those. As for this tool, I guess you still gotta wait just a bit longer..
Edited by iliveinabox05 at 00:43, 16 Feb 2019. I've updated the original post with a google drive link where the H4 Resource Editor can be downloaded. It does require Java, so I'll also add a link which contains instructions for that as well. Edit. Apparently I can no longer edit the original post because it is more than a year old. It says to "ask a moderator", but we don't currently have one (I have tried pming our mod for about 6 months now and my message has never been opened). It would be nice if a mod from another forum could mark this as a project so that I can continue to update the original post with pertinent information. I suggest asking the mod Galaad.. perhaps he can be of assistance.. Very long wait for open file Heroes4.h4r? Edited by kkfkkkfk at 14:05, 17 Feb 2019. I've downloaded it. It seems that it can only view buildings in H4D format. And Some of the words were covered up. Thread rated as project per OP's request. kkfkkkfk - Thanks for the feed back. I'll get that annoyance taken care of, and as Karmakeld said, I do plan to give you the option to export as .obj or whatever other file extension the game uses. Edited by iliveinabox05 at 06:34, 25 Feb 2019. Yes, that can sometimes be the case, since the file is quite big. It usually takes my laptop a couple seconds to open it. I did make it so that it only tries to parse the table of contents, but that can still take a little time on the bigger .h4r files. Edit. Michael, so I was going to revisit the ability to change an object's type, but the list you sent me is not really viewable using notepad. I thought somewhere you mentioned what to view the file with, but I'm currently unable to find where you posted that (and I'm tired so I didn't look for too long), so could you remind me what I should use to take a look at the object types list? It might be a memory issue with your machine. Jonny had an issue like that as well. In the folder where you are running the H4 Resource Editor, there should be a text file called something like "H4ResourceEditorLog.txt"
Could you please upload that somewhere and send me the link so I can have a look? Edited by iliveinabox05 at 22:17, 04 Mar 2019. I got all the major type mapped to minor types and update the minor type combo box depending on which major type is selected in its combo box, but I need one more thing before I can finish implementing the ability to change an object's type: I now need each major type code (number) associated with each major type, as well as each minor type code associated with each minor type! I need this because if you change the major / minor types, then I need to also update the corresponding major / minor type code. Anyone have this offhand? I guess I could make a map and drop one of each major / minor type, and then add a little debug to the H4MG to print out each major / minor type + its code..